Rob Lewis is an AV rated attorney who is a passionate advocate for his catastrophically injured clients and their families. He devotes the majority of his practice to representing children who are needlessly and tragically devastated by brain injuries at birth as a result of poorly managed labors and negligently executed deliveries. He is currently the Co-Chairman of the American Association of Justice’s Birth Trauma Litigation Group, a national organization of attorneys who are devoted to serving injured babies and their families. He is also a member of the Birth Trauma Litigation Group’s Executive Board and the immediate past Co-Editor of the Birth Trauma Litigation Newsletter. Rob has successfully tried and settled many cases involving birth injuries, including those involving Cerebral Palsy, perinatal stroke, hypoxic ischemic encephalopathy (HIE), and traumatic injury. Similarly, he has successfully tried and settled cases involving many other types of medical negligence, including cases involving brain injury, spinal cord injury, cases involving clients who have been injured and killed by the negligent administration of anesthesia, and cases involving families who have lost their loved ones due to nursing home abuse and neglect. He believes in giving his all for the people he represents and fighting for them while keeping in mind that litigation is usually not their first choice and that their lives already have been complicated by injury and loss. He frequently writes and lectures on birth injury, medical negligence, litigation and trial practice. He is the Immediate Past Co-Chair of the Medical Negligence Information Exchange for the American Association of Justice. He is a member of the Executive Board of AAJ's Birth Trauma Litigation Group. He has spent most of his life in the Cincinnati/Northern Kentucky area. He is a 1989 graduate of Miami University in Oxford, Ohio and a 1997 graduate of the University of Cincinnati College of Law. After graduating from Miami, he served as an officer in the United States Navy and as a Division Officer on the USS Moosbrugger (DD-980). After graduation from the University of Cincinnati, College of Law, he had the honor of serving as a judicial clerk to the Honorable William O. Bertelsman, then Chief Judge of the U.S. District Court, Eastern District of Kentucky. At the University of Cincinnati, College of Law, he served as Articles Editor and as an Associate on the Law Review. 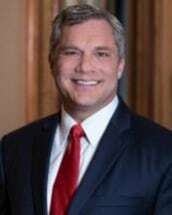 He is a member of the Ohio and Kentucky Bar Associations, AAJ (American Association of Justice), OAJ (Ohio Association for Justice), and KJA (Kentucky Justice Association). He is a Past- President of the University of Cincinnati College of Law Alumni Association. He lives in Northern Kentucky with his wife, Jennifer, his three kids, his two dogs, Martin and Molly. In his free time, he enjoys spending time with his family, attending his kids’ school and sporting events and serving on the Board of the Northern Kentucky Montessori Academy. Rob also spends a great deal of time arguing with his wife, Jennifer Lawrence, who is also a lawyer.